Me, Myself, & I was one of my most anticipated new comedies of the Fall season. I'm a huge fan of Bobby Moynihan, and the show has an intriguing premise that had me interested even before Moynihan joined the show. Add John Larroquette and Jaleel White to the mix and you've got a really great cast. I'm hoping the show can be as good as I'm expecting it to be, and that it'll be worth the wait. In 1991, Alex Riley's Mom gets engaged to a pilot, which means he has to move to LA. He is woken by his soon-to-be stepbrother Justin, who is calling him little bro, which annoys him. At breakfast, the table wobbles and Alex shows the family his invention, an adjustable table wedge. His stepfather tells him that one day, he may actually be a famous inventor. Later that day, Justin and him are talking when Alex sees Nori, who he pretty much falls in love with. She speaks to Alex, and she drops her lip balm. Alex uses the Extend-o-Grab 5000 to retrieve it, and she officially introduces herself to him. At dinner, Alex sees Nori again and she waves at him. Justin says that Nori's into Alex, and he suggests that Alex asks kisses her at the dance. At the dance, Nori and Alex say hello to each other. Justin tries to convince him to ask her to dance, but Nori asks Alex before he gets the chance to ask her. While they're slow-dancing, Justin gives him a mint and tries to convince Alex to kiss Nori. This lead to a big problem, because Alex chokes on the mint and it lands in Nori's mouth. Because of this ordeal, Alex is labeled Chokey and is ridiculed. Alex goes home, and Ton gives him a pep talk, which involves Alex's hero Michael Jordan. He reminds him that everyone misses shots every once in while, even the greatest of basketball players. Alex decides to totally avoid Nori. In 2017, Alex comes home to discover that his wife is having an affair with a paramedic. He responds to this by running outside and throwing a rock at the ambulance's windshield. It may not be the most responsible thing to do, but the response is understandable. Later on, he is pitching the "Switchfork" to a group of investors, and they aren't having it. His friend Darryl is giving him some tough love, because his company isn't doing well (at all), and he needs help. Alex is driving with his daughter Abby, and he hears a song that "reminds him of a girl" (aka Nori). His daughter asks if he's talking about her mom Sarah, and he responds that her Sarah's song is Psycho Killer. When they arrive at the house, Alex sees a For Sale sign. Sarah tells her that her boyfriend is moving to San Francisco , and that she'll be leaving with him. Alex is upset that she's leaving Abby behind, but that isn't her plan She wants to take Abby with her. They get in an argument over it, and she says that he'll never be able to take care of Abby if he can't take care of himself. He says that he just needs one idea to turn everything around. Alex is really struggling to think of an idea, and he tries everything to get some ideas flowing. Alex goes to see Ron, and Ron gives him an idea when he purposely drops his fork. In 2042, Alex has a heart attack opening the New York Stock Exchange. He survives, and is released from the hospital. Alex's assistant Jasmine gives him a gift from Darryl, and they walk into the company, where they're having a welcome back party for Alex. Alex announces his plans to retire immediately, which surprises everyone. 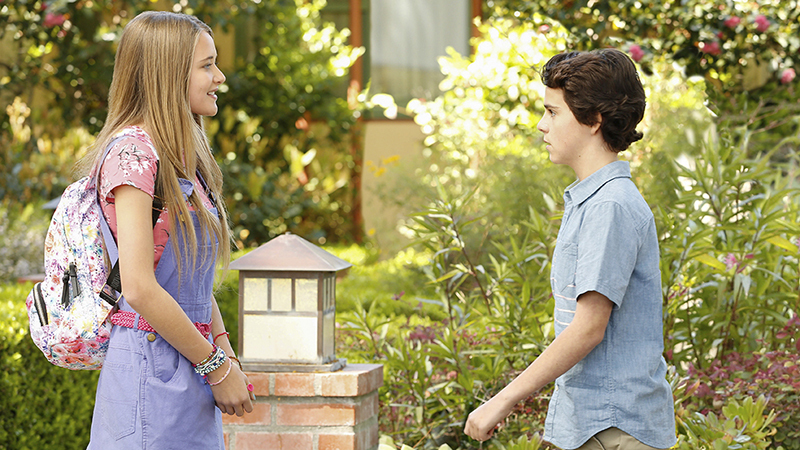 Abby takes Alex to eat, and when checking out, Alex sees Nori. They start talking over some food, and while he leaves initially, he heads back in and gives her a kiss. I really enjoyed that Pilot! It was so heartwarming and funny, and I loved the three different timelines. While we didn't get to see much of the 2042 timeline, I absolutely loved the ending, and it's nice to know that, despite some rough patches for Alex in the earlier timelines, things do get better. It could be funnier at times, but I still really enjoyed it. I think this is going to be a really great show. And remember guys, Keep Shooting. You know how I feel, but what did YOU think of the Me, Myself, & I premiere? Vote in the poll below, and let me know what you thought in the comments below. What grade do you give the Pilot of 'Me, Myself, & I'?